This is a friend’s mini that I offered to paint for him. I don’t know what company made it. Perhaps he’ll comment on that… We’ve been playing a Boot Hill game for the past year or so, so we need lots of cowboys, indians, and other pioneer types. It’s not exactly a high-quality sculpt or casting, but it looks very nice on the table. 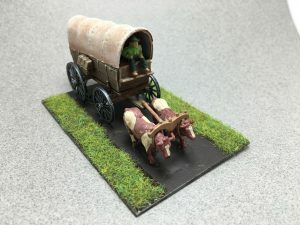 If you look too long you realize that the oxen are way too small compared to the size of the wagon. Regardless, it was fun to paint and looks great on the gaming table. 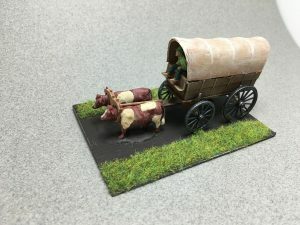 IMEX, from the Prairie Schooner and Chuck Wagon set. 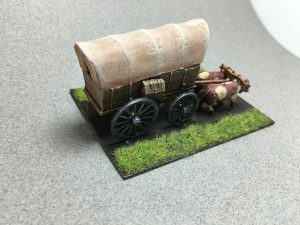 They do a bunch of kits mostly focused on US history.